Forty days and forty nights. That’s how long Susan Blum was in hospital recovering from life-threatening injuries because of an encounter she had with . . . a tree root. Blum’s run-in with the root occurred when she was participating in a bike festival in early June near Prince Albert. The long-time competitive cyclist, who logs more than 10,000 kilometres a year on her bike, was coming down a hill on a clear, straight line when her front tire jammed against the root and abruptly stopped. Blum’s forward momentum threw her over the handlebars face-first onto the ground and, with her shoes clipped into the pedals, the bike cartwheeled overtop. Upon her arrival at RUH, the trauma and surgical teams spent nine hours triaging and treating injuries involving her spine, fractured ribs, a dislocated shoulder, severe facial cuts and broken hands. Blum spent eight days in the Intensive Care Unit (ICU) before being moved to Surgery 5000 in-patient ward and then others wards at RUH, and later transferred to Saskatoon City Hospital for intensive rehabilitation care. Blum is extremely grateful for the care she received at each stage of her hospital stay. Her only trepidation occurred during her transition to an in-patient unit from the ICU, where she had been receiving one-to-one nursing care and constant monitoring of her vital signs because of her spinal cord injury. Because the transfer of stabilized trauma patients from the Emergency Department and the Intensive Care Unit to an in-patient ward is one of the most intricate in the health-care system, some fine-tuning of the current process is now underway. 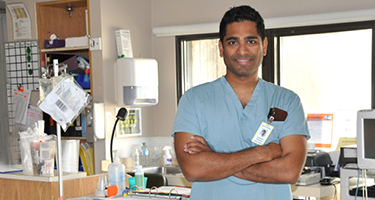 RUH’s Medical Director of the Trauma Program Dr. Niroshan Sothilingam and others have come up with a plan to ensure the patient “hand-off” is done as safely and effectively as possible. The creation of a dedicated Trauma Observation Unit in the existing Surgery 5000 unit will cost $500,000. Funds from Royal University Hospital Foundation and its generous donors will purchase two central observation monitors, six vital sign monitors and six new beds, and as well support staff training. Development Officer, at 306.655.6477 or donate online.